The Energy Information Administration reported crude inventories rose by +8.4 million barrels in the week through January 22, bringing the total in storage to 494.9 million barrels, the highest on record. The build was helped along by refineries only operating at 87.4% of capacity due to maintenance season. Refiners used approximately 551,000 barrels per day less oil than the previous week, with inputs averaging just over 15.6 million barrels per day. The reduced refinery capacity did lead to a reduction of gasoline and distillate production, but total gas inventories still increased, rising by 3.5 million barrels. Distillates (which includes diesel fuel and heating oil) on the other hand saw stockpiles fall by 4.1 million barrels. Much of that drawdown is being equated to colder weather however, so the demand increase may be very short lived. 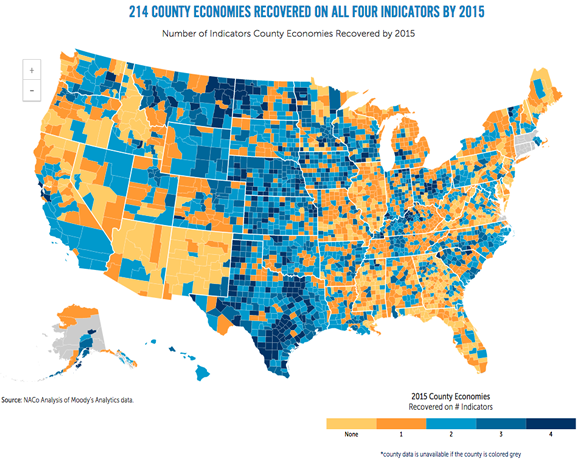 By 2015, 214 county economies recovered to their pre-recession levels on all four indicators analyzed, almost three times more than by 2014. 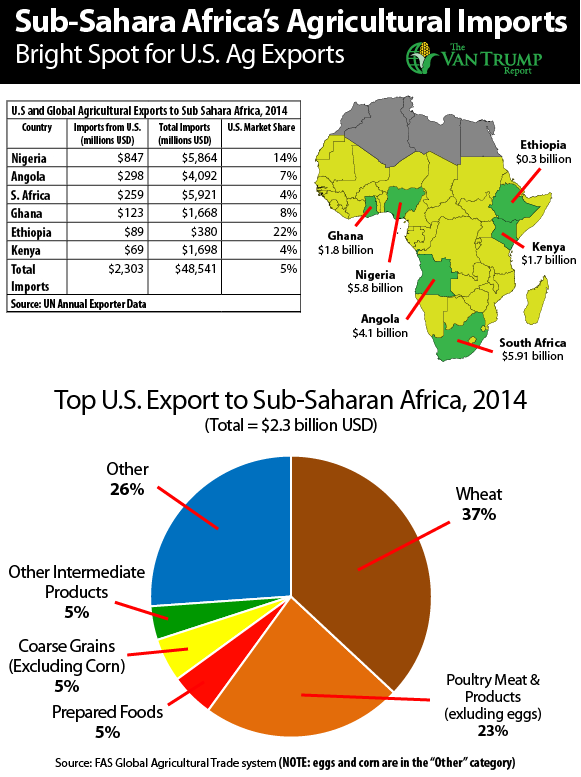 Most of these county economies are in Texas, Nebraska and Kansas. For the first time, 17 of the 126 large county economies — in counties with more than 500,000 residents — are part of this group. The majority are in California and Texas. Overall, the county economies recovered on all four indicators by 2015 still represent only 7 percent of all county economies. In contrast, almost 16 percent of county economies had not recovered on any indicator by 2015, mostly in the South and Midwest. States such as Florida, Georgia, Illinois and Mississippi have more than a third of their county economies still reeling from the latest downturn across all economic indicators. As you can see, the darkest blue indicates counties that have totally recovered on all four of their indicators. Most of the country’s counties, though, are still stuck on the lower end of the spectrum. As you can see, the colors for 0-2 recovered indicators far out number the fully and mostly recovered counties. Last year, 72 of the recovered counties were in Texas, the most of any state. Nebraska followed with 22. Minnesota, Kentucky, North Dakota, Montana and Kansas each had at least 10 fully recovered counties. Meanwhile, in 27 states, not a single county had fully recovered. 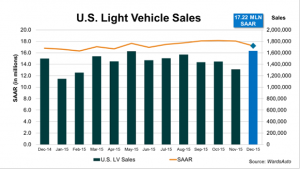 U.S. vehicle sales broke the all the all-time record in 2015, though they did not finish off the year with quite the strength expected. December’s results still were strong, totaling a seasonally adjusted annual rate of 17.2 million units, rather than the lofty 18 million that many analysts were anticipating. Non-seasonally adjusted, total sales came in at 17.5 million, a +6% increase from 2014 and compared to the 2000 record of 17.4 million. According to Kelley Blue Book, the average transaction price for December sales was $34,428, up about $297 from December 2014. They also note that luxury sales spiked in December, accounting for around 15% of the market, more than 2% higher than the rest of the year’s average. In addition, SUVs and trucks continue to make up a larger share of sales, which is also helping to boost average transaction prices. Some individual company highlights included an +8% year-on-year retail sales increase for GM, boosted by high demand for Silverado and GMC Sierra pickup trucks. Fiat Chrysler’s annual sales were up +7%, with the groups Jeep brand sales up +42% in December alone. 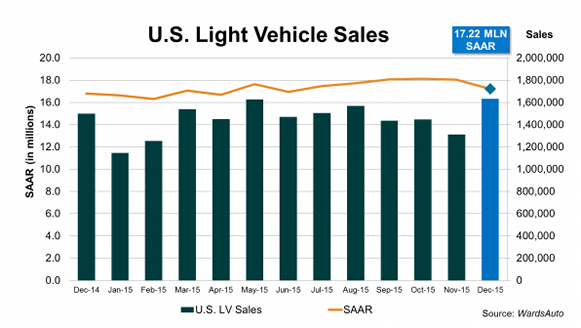 Ford’s full year sales rose by +5.3%, led by increased demand for its Lincoln brand MKC and Navigator SUV models.